Here's the updated printable checklists. Hopefully 2010 is locked down and won't change around any more. And 2011 is starting to space out a little better, although I bet I'll have to cram 5 or 6 figures into one month sometime in 2011. Enjoy and have good holidays if you celebrate them! just to inform you the site is updated with new pics, colors and graphic. My Deviantart http://nijirain.deviantart.com - I accept commissions for drawings and custom/sculpts! Thanks to everyone for creating and updating all their checklists. I been away from MOTU collecting past several months now and these checklists with all the figure releases in chronological order is just what I was looking for. Thanks . Vikor and Eternian Palace Guards are now pictured. Great checklists and stuff, gang! Keep it up! Do you ever plan to do beasts (Battle Cat, Panthor, Swift Wind, Shadowbeast, Gy-Gor) and vehicles? Your list is fantastic, but I hope it is wrong in July. I really don't want Horde Troopers that soon. I need to save up $480 for Horde Troopers which I was hoping for November - December. Because I am trying to save $500 for Con, which will handle my MOTUC CC exclusive and DCUC. I spent over $300 last year trying to catch up with all the DCUC (My Display Case looks awesome) I could not find in stores at one booth. That was Day 1 at con in under 5 minutes. What month was the Palace Guards originally scheduled for before all the complications, was it not November? I don't have any immediate plans for including beasts right now. I'm still wondering how I would do such a list, which most likely would be a different list from the figure list. Maybe I should just do a beast list and not include vehicles and such. Maybe after the Shadowbeasts and Panthor come out, I'll create one. Maybe just add the beasts under the regular figures for each year they fit? Last edited by RockinHard; January 2, 2011 at 01:40am. Great lists guys! Much thanks! I agree! Your lists soundwavempl are my faves! Simplicity at its best! Thank you! Here's the latest 2011 checklist. I used MasterEnglish's version of Catra until they release the official non-Toyfare image. But for now this will do. JOS, Evil-Lyn is no longer the reissue for Jan. It's the Goddess now. Evil-Lyn is no longer the reissue for Jan. It's the Goddess now. MOTUClassics.Com - Reviews, Release Schedule, Bios, & News. Great job on the checklists fellas! I view them often. soundwavempl, my only suggestion would be to remove MOLAR from your vintage page. I want to forget that fig exists. Don't we all? 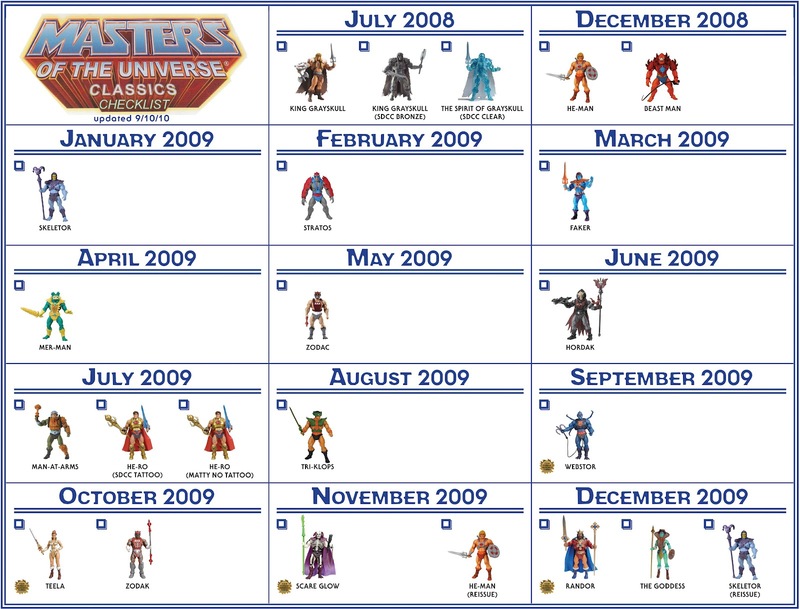 Masters Of The Universe Classics from Vintage Visual Checklist 2008-? Includes; -Blue He-Man; Power Sword, Axe, Shield, -Gray/Green; 200x Electronic Power Sword, -Beast Man; Yellow Armor, 2x Yellow Shoulder Pads, Red Whip, -Purple Cosmic Enforcer; Armor, Pistol, Staff, -Silver Horde; Crossbow, -Gray Moss Man; Mace, -Silver Man-At-Arms; Sword, Pistol, -Gray Scareglow; Voulge, -Red Stratos; Jet pack, -Silver/Gold Tri-Klops; Sword, -Gray Webstor; Rifle. According to the "ISO 8601 international standard" By using this format alphabet orderings and chronological orderings are identical. MOTUC figures go on sale at www.mattycollector.com at 12:00 PM Eastern U.S. time zone (Click here to check what time it is at this very moment in Eastern). Everything has/had a retail price of $20 on Matty Collector unless noted otherwise. Most figures that where released in 2008 and 2009 with the addition of 2010 figures that sold out fast, will be re-released again in the near future. The majority of the re-releases will only have one change; the addition of a starburst on the package that says "THE ORIGINAL". Early releases who didn't come with a white mailer box, will come with one for the re-release. So far, only 2 known figures came with major changes/fixes. They where He-Man and Skeletor. He-Man's first release from 2008 had reversed shoulders, there where fixed in the re-release. He also had the red around his eyes removed, and less gloss on his body to match the other figures in the line. Skeletor's changes where a closed left hand to hold both his weapons better and a new face deco. Skeletor's Bio had the addition of Demo-Man. Hordak received a fixed title from "Ruthless Leader of the Evil Horde" to "Ruthless Leader of the Evil Horde". In addition to the 12 monthly figures, there will be 8 additional "quarterly" figures released each year consisting of 4 quarterly bonus figures and 4 quarterly large scale figures or creatures. The 4 quarterly bonus figures will be A-list hero and villain updates such as Battle Armor He-Man and King Grayskull. The quarterly large scale figures/creatures will be releases like Battle Cat, Tytus and Gygor. Every year there will be one or two additional exclusive Comic Con figures. These figures are unique releases at the convention and will be later released on the mattycollector website (usually at the end or the beginning of a month) with some additional changes. The first two con exclusives; King Grayskull and Faker didn't come with any changes. It started with He-Ro. He-Ro's con exclusive figure came with a SDCC tattoo, while the mattycollector version came without the tattoo. The SDCC Orko is made of a translucent plastic and will have a color change feature with the addition of a disappearing SDCC logo on the magic book. Orko's mattycollector version will have a regular color and no SDCC logo on the magic book. Both will come with the same Prince Adam figure pack-in. Mo-Larr and Skeletor will be released exactly as as without any changes. The Club Eternia 2009 registrations where open from 18/05/2009 till 22/05/2009. If you subscribed, you received 4 figures in total from September till December 2009. These 4 figures where: WEBSTOR, TEELA, SCARE GLOW and KING RANDOR. There where no extra bonus items or figures for subscribers in 2009. The Club Eternia 2010 registrations where open from 22/07/2009 till 14/08/2009. If you subscribed, you will receive 12 figures in total from January till December 2010. These 12 figures are: PRINCESS ADORA, TRAP JAW, MOSS MAN, EVIL-LYN, OPTIKK, SHE-RA, COUNT MARZO, WHIPLASH, CHIEF CARNIVUS, ROBOTO, GRIZZLOR and BUZZ-OFF. In April, Club Eternia 2010 Subscribers received the Club Eternia Exclusive figure: WUN-DAR and a MAP OF ETERNIA (with unique Eternia Bio printed on the back) Both where only, exclusively available to the subscribers. There will also be a few other goodies included throughout the year for members of the Club Eternia 2010 such as coupons ($8 off Battle Cat) and promotional items. Re-Issue figures and convention exclusive items/figures are not included in the Club Eternia Subscriptions. 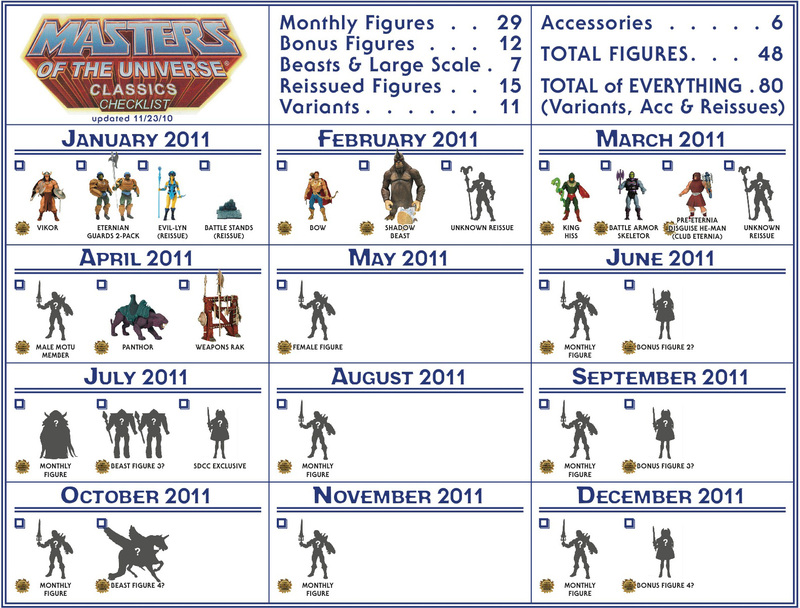 The quarterly bonus figures and the quarterly large scale figures/creatures are not included in the Club Eternia 2010 Subscription. 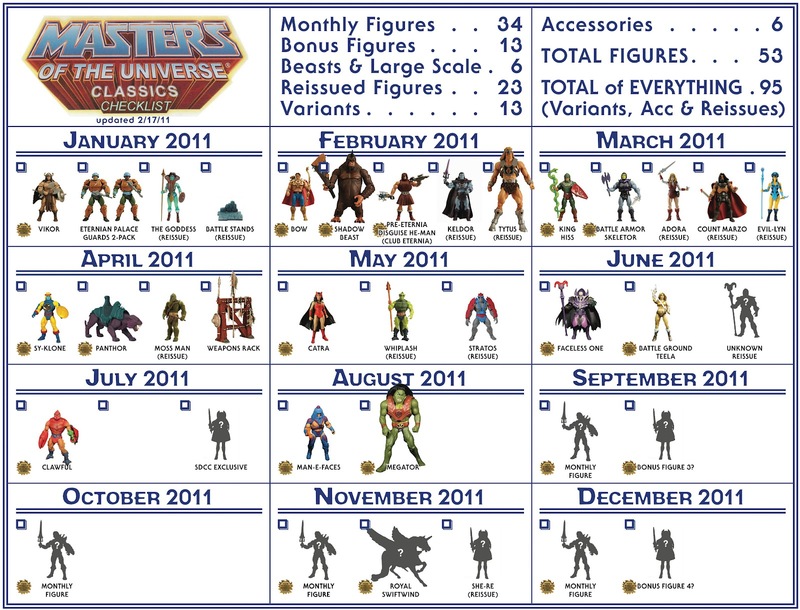 They will however be included in the Club Eternia 2011 subscription program. The Club Eternia 2011 registrations where open from 21/07/2010 till 11/08/2010. If you subscribed, you will receive 17 figures in total plus an additional army builder 2-pack and 3 beasts from January till December 2011. The 3 Beasts will be: SHADOW BEAST, PANTHOR and ROYAL SWIFT WIND. The army-builder 2-pack hasn't been revealed yet. In March, Club Eternia 2011 Subscribers will receive the Club Eternia Exclusive figure: PRETERNIA DISGUISE HE-MAN and a MAP OF ETHERIA. Both are only, exclusively available to the subscribers. There will be a new benefit for subscribers in 2011, the figures will ship 2 days early. example: If the figure goes on sale at the mattycollector website on a Friday the 15th, subscribers will get their figures send on Wednesday the 13th. If there is a weekend in between and the figure goes on sale at the mattycollector website on a Monday the 15th, subscribers will get their figures send on Thursday the 11th. 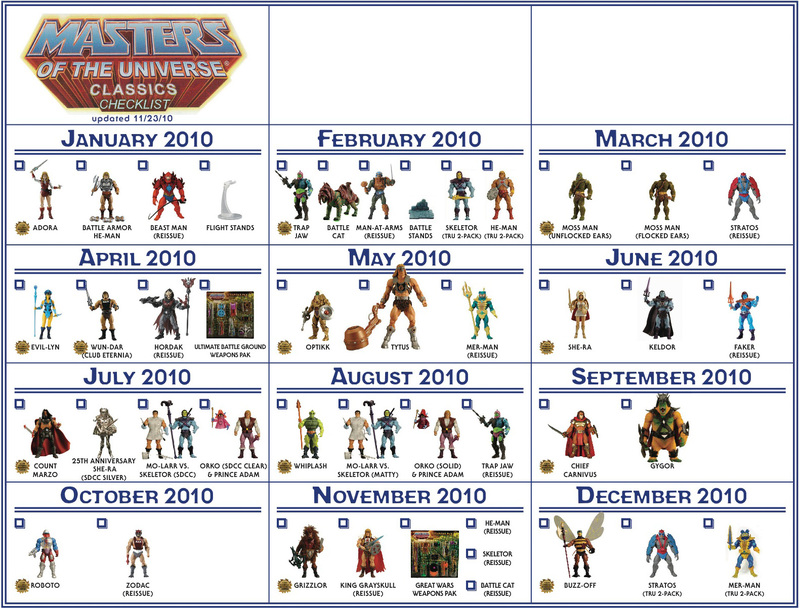 What is exactly included in the Club Eternia 2011 subscription? You will be billed every month for that month's release. If there are multiple figures being released in that month, (example: 1 Monthly figure, + 1 Quarterly figure) the shipping costs will be combined and you will receive them together in 1 package. If you order anything else from mattycollector, shipping will NOT be combined with your subscription package. At the end of 2011, the total cost for the subscription + shipping within the US, would be approx. $600 usd (which is approx. $50 usd per month). Based off the sales of Club Eternia 2011, there will be a 2012 subscription as well!!! What we can expect of it is still subject to change since it's not been officially announced yet. and you'll be able to purchase as many subscriptions as you like. There will be a $20 sign-up fee per subscription. The Club Eternia 2012 subscription will have 1 exclusive bonus figure available to subscribers only (like Wun-Dar and Preternia disguise He-Man from the 2010 and 2011 subscriptions). ToyGuru stated that the line is planned through 2016 because for collector lines, it's important to think way ahead. However, the roadmap master plan has to be green lit each year by Mattel's management (which happens in the fall of each year) for the next year's product lineup. Changes to the roadmap planning are made where needed, which usually is based upon the sales and or new entertainment. A figure could not go through or could be moved around. So even with a master plan roadmap in place, things are always in flux. Nothing is locked down until a figure goes into production. "POP She-Ra's vintage toy Sword of Protection"
"Electronics in Vehicles if possible (not motorized)"
Young Prince Adam (MYP 200X)(based upon a drastic design change) -- may come with his own unique Bio? MOTU He-Man (classic version) * Has been made! MOTU Skeletor (classic version) * Has been made! 200X King Grayskull * Has been made! MOTU He-Ro * Has been made! MOTU Green Goddess * Has been made! POP Adora * Has been made! MOTU Hordak * Has been made! MOTU Prince Adam (Prince Adam in 2010 !?) * Will be released in July 2010! SDCC July 26–29, 2007 First MOTUC Prototype figure: He-Man! Last edited by synthalus; April 24, 2011 at 08:34am. here's the updated checklist with new toyfair info! 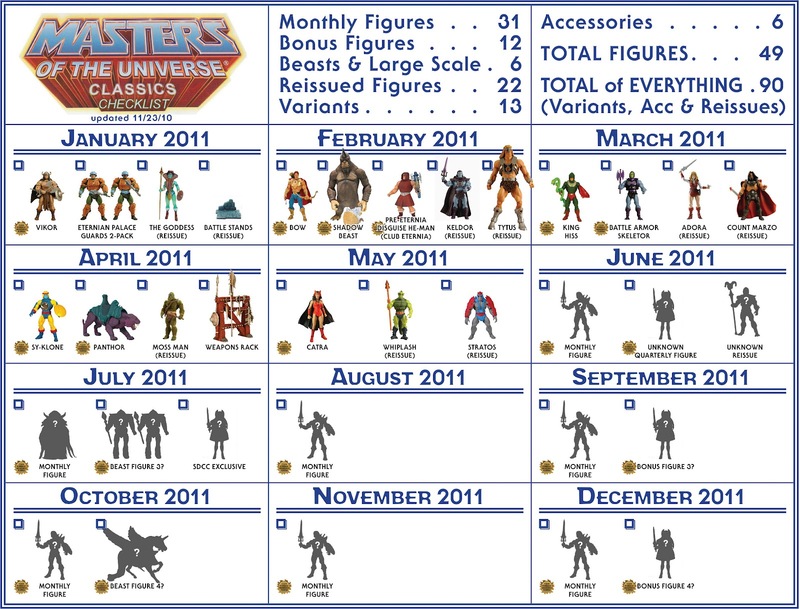 Here's the updated 2011 checklist with the Toyfair info included. I couldn't find a full photo of Megator, so I just used the old toy version for now. I'll update it later when there are better images around. Sounds good and take care of Eternia! That's a great checklist jackofsquares. Is that Catra a custom though? Doesn't look entirely like the Mattel version...? GREAT! I live by your checklists jackof squares! THX FOR THE CHECKLIST JACKOFSQUARES. FOR SOME REASON YOUR USERNAME COULD BE MISSPELLED FOR SOMETHING ELSE. JUST CAUGHT ME BY SURPRISE. Check your local WEATHER here & enter zip. March is gonna be EXPENSIVE for me..
A little late, but I finally managed to update the list. I'm in the middle of moving which is extremely hectic. I added images for Man-E-Faces and Sy-Klone and updated the re-release info for Moss Man.